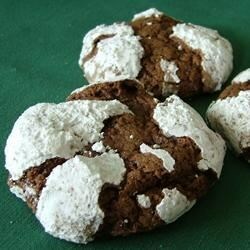 "Delicious chocolate cookies with a crackled coating of confectioners' sugar." WAY TOO DRY, texture was like sawdust, and not much flavor. Husband was not pleased. I was ashamed of these cookies and I consider myself a reasonably good baker. Will never make again! This recipe is pretty tweakable. I used cocoa instead of chocolate and oil instead of shortening, and it was still great. Im glad I ran across this. Definitely worth it.